The holidays are creeping up on us! I always like thinking about favorite books and movies to help put me in the spirit. 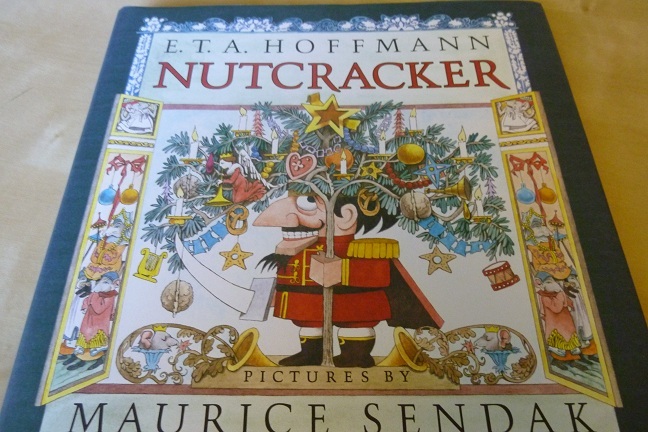 This year, I was fortunate to find a new (to me at least) book with a Christmas theme: Nutcracker by E. T. A. Hoffman, illustrated by Maurice Sendak. You may be familiar with the Nutcracker ballet–and this is not quite that. The ballet is based on the story, and you can certainly see the same outlines. But as often happens when stories are translated from one medium to another, things changed along the way! 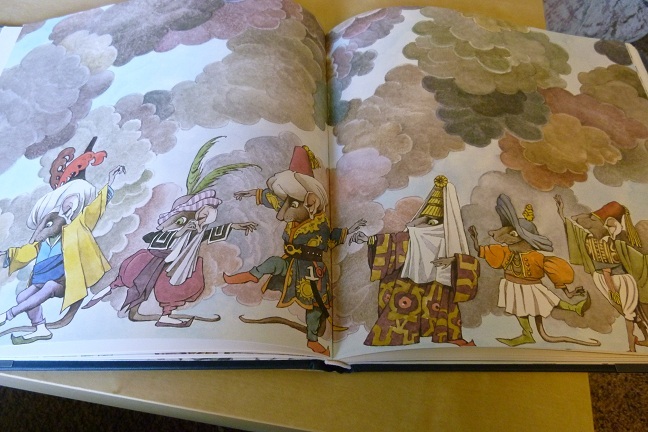 The plot is a bit different and, in this particular edition, so is the atmosphere created by Sendak’s illustrations. Like the ballet, the story begins with Christmas Eve, as Marie (or in the ballet, Clara) and her brother Fritz open their Christmas presents. Marie’s favorite is the wooden Nutcracker. That night, after everyone else has gone to sleep, Marie is in the parlor with the toys. She witnesses a fight between the toy soldiers led by Nutcracker, and the fearsome, seven-headed Mouse King–or did she just dream it? Here the story diverges from the ballet. Marie is injured in the fight (or did she just put her arm through a glass cabinet?) and while she’s sick in bed, Godfather Drosselmeier tells her a fairy tale story of how the Nutcracker was cursed, and the roots of his enmity with the mice. This is a lovely Christmas tale, with much the same charm and feel as the Brothers Grimm (though maybe less grim than their darkest!) The book is really a novella, including the long story-within-a-story in the middle. The odd story about the cursed princess who can only be cured when a magic nut is cracked is great fun, and Marie has her share of adventure too. The illustrations are obviously a big part of this book, and there are some beautiful ones. Don’t expect the tinsel and glitter of most productions of the ballet, but Sendak brings the characters to life with his own unique style–and with particularly elaborate costume details. There are many full-page spreads, including a series of pages in a row when Marie and Nutcracker travel to the magic country. There’s even what looks like a “Wild Thing” peering around a rock in one of those pictures! My favorite thing about the book may be the charming narrative voice. J. M. Barrie has won my heart forever by being the most charming of narrators, and so when I say Hoffman reminded me of Barrie in some moments, it’s a high compliment. He has the same trick of addressing the reader that I enjoy so much, and there’s also some great tongue-in-cheek humor. The edition I have was just released last October, and it’s physically a beautiful book. It’s a large hardback, and seems designed to make a wonderful holiday gift! Disclosure: I received a free copy of this book from the publisher in exchange for an honest review. It’s…Sunday, What Are You Reading? Sounds like a great gift for anyone who loves the ballet and wants to know more about the story that inspired it. 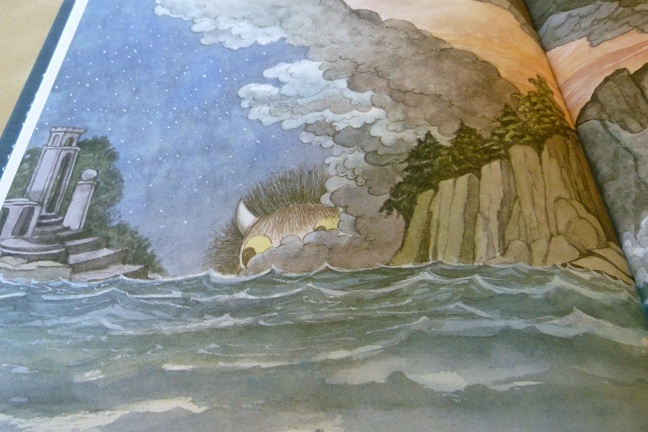 Illustrations by Sendak are a real plus – something very different from what you’d expect, in his unique style. Thanks for sharing this book with your readers. Sendak definitely has a unique style, and it was fun to see it with this very different story. Maurice Sendak! I so want this edition. I read this a few years ago, and it was so much stranger and darker than I had imagined from pop culture references to the story. I enjoyed it a lot. The Grimm comparison is a good one, though it’s definitely not as dark as Grimm at their darkest! It was quite different than I expected too! But I only knew the ballet…and there’s a whole introduction to this book about how they wanted it to be different from the ballet. They obviously succeeded!